Oliver deGray Vanderbilt Jr. was born August 23, 1884 in Brick to Emily and Oliver Vandebilt. Oliver attended East Orange High School, where he excelled at the popular new game of basketball. He was accepted to Princeton in 1902, and acquired the nickname “Shave.” Oliver was also an accomplished horseman, tennis and squash player. Most experts consider 1904–05 to be the start of modern era of college basketball. In the 1930s, the Helms Foundation retroactively named its All-America team for that season. The top player in the country was Christian Steinmetz of Chicago, but five Ivy Leaguers accompanied him on the First Team—two from Yale, two from Columbia and Oliver. There was an irony in these selections, as Oliver saved his best games for the Tigers’ matchups with Columbia. 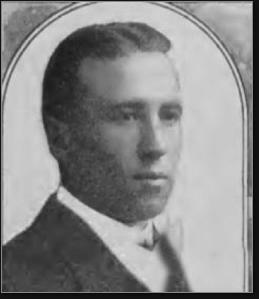 His performances against the Lions were described by classmates as “wholesale slaughter.” It’s worth noting that the 1904 and 1905 Columbia teams were later recognized as national champions. The coach of the 1904-–05 Tigers was Fred Cooper. He led the team to an 8–5 record. After graduation, Oliver formed an auto parts company and then went into the railroad business for his future father-in-law in Cincinnati. While there, he helped established the Camargo Hunt Cup. In 1912, Oliver helped manage Woodrow Wilson’s presidential campaign. He married Madelon Weir that year and produced three children, including a son, Oliver III, a successful industrialist and financier, and one of the country’s top polo players in the 1930s. Though largely forgotten in hoops circles, Oliver did gain some measure of notoriety as the American importer and distributor of Perrier bottled water. He passed away at 75 in Ohio.